“Oh, thank you, thank you, thank you.” I lunged forward in an exaggerated show of gratitude and threw my arms around his waist, embracing him tightly. He flinched and tensed up for a moment. I’d caught him off guard. Eventually he relaxed and put one arm around me, awkwardly patting my back in some semblance of a hug. “Psycho and stalker are your words, not mine. But, if the shoe fits…” He trailed off, and I smacked him on the arm. “Ouch!” Andy rubbed the place I’d just hit. “I’m only kidding. I don’t think you’re a psycho stalker. I’ve never seen any indication that you’re a stalker. You’re more likely a plain old psycho.” He was grinning nice and big now, and I couldn’t help but grin back. Perfectly You is Robin Daniels second book, and also the second book in the Perfect Series. I enjoyed the first book in the series immensely, so I was very eager to get my hands on the second book and see which characters would get their story. Perfectly You introduces us to a new set of teenagers, set in the same high school. That to me was a little confusing, as I was expecting to have a little bit of a spin off or a story of one of the supporting characters, but this wasn’t the case. Perfectly You introduces us to Ivy, a very outspoken, speaks before she thinks, opinionated girl, that is in with the in-crowd. 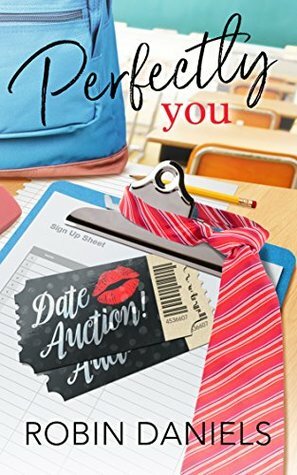 She is responsible for the date auction, and is determined to get it right, as she doesn’t want to prove to her ex-boyfriend she can’t get the job done. On the verge of closing of the auction with one name short, she enlists Andy as the final date, her quiet art partner. This whole book is a quite predictable tale of Ivy trying to transform Andy into a mayor hottie, and discovering a lot about herself along the way. Andy’s interest in Ivy made him want to make certain changes for her, but her comments at time made without thinking were hurtful, and Andy was man enough to call her out for it. I loved Andy. He embodies what I feel every teenager should strive to be. He’s a regular guy, that has seen the shallowness and competitiveness that is so apparent in many, and has chosen to walk the road not travelled by many. He’s comfortable being a loner, knowing he’s being true to who he really is. Ivy on the other hand may be very outspoken about her opinions, to the point of being hurtful (luckily she grows throughout the book), but still tries too hard in my opinion to fit in. At one point in the book she drags Andy to a party and pressures him to have a drink to make him feel more relaxed. Luckily he refuses, which makes a strong statement in the book, but it made me like Ivy less. She really needed a lot of growth throughout the whole experience. Lilly is the cherry on top. She is an amazing friend, a wonderful character, and reminded me of Libby in the Science Squad series by Kelly Oram. She added a whole array of color to this book, and I enjoyed reading her parts a whole lot. All in all I found this book a great read, and thinking back on it, I can conclude that the drinking at the party suggestion adds some extra reality to it, but did make me like Ivy less.